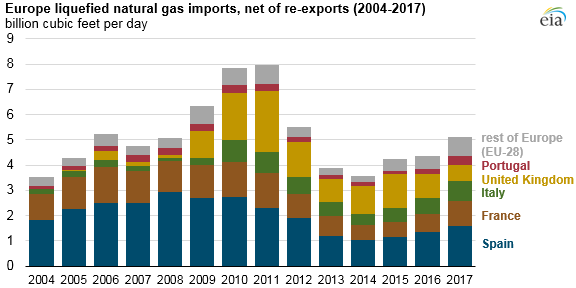 Imports of liquefied natural gas (LNG) to the 28 countries that make up the European Union (EU-28) averaged 5.1 billion cubic feet per day (Bcf/d) in 2017, increasing for the third consecutive year but remaining below their 2011 peak. In 2017, imports of LNG into EU-28 accounted for 13% of the global total. 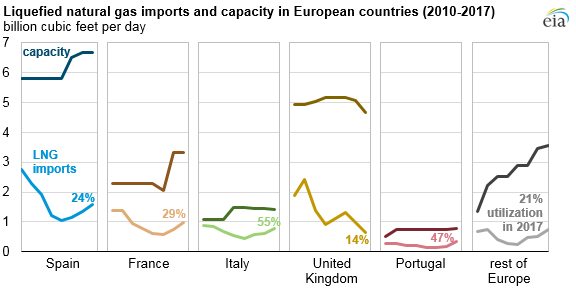 LNG import capacity in EU-28 currently stands at 20 Bcf/d, or almost one-fifth of the global total, but utilization of EU-28 LNG import facilities has declined from about 50% in 2010 to between 20% and 25% in recent years as expansions in regasification capacity far exceeded demand for LNG imports. Currently, 13 of the EU-28 member countries import LNG. In 2017, LNG accounted for 11% of EU-28’s overall natural gas supply. Domestic natural gas production in EU-28, two-thirds of which is in the United Kingdom and the Netherlands, has steadily declined in recent years and in 2017 accounted for 25% of EU-28 natural gas supply. European natural gas production is expected to continue to decline because of an aging, mostly depleted resource base. In addition, the Netherlands’ largest natural gas field, Groningen, has been subject to increasingly strict production reduction measures. Imports of natural gas by pipeline, in particular from Russia and Norway, have increased. In 2017, natural gas imports from Russia provided 35% of the total EU-28 supply and Norway provided 24%. In the first six months of 2018, pipeline imports from Russia continued to increase, averaging a record 17.1 Bcf/d, 8% higher than in the same period last year, based on data from S&P Global Platts. EU-28 LNG imports have largely followed trends in regional natural gas consumption. From 2011 through 2014, relatively high natural gas prices led to less consumption of natural gas for electric power generation in several EU-28 countries, especially the United Kingdom and Spain. More recently, the use of natural gas in power generation increased in the EU-28. 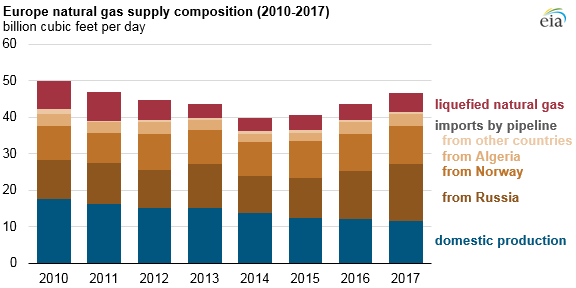 In 2017, several factors such as low hydroelectric output in Spain, Italy, and Portugal as well as unplanned nuclear plant shutdowns in France led to greater natural gas consumption and higher LNG imports. Going forward, LNG imports in Europe will have to compete on a cost basis with existing and new pipeline supplies of natural gas, particularly from Russia. A new undersea pipeline from Russia to Germany—Nord Stream 2, with a capacity of 5.3 Bcf/d—has secured permits needed for construction in Russia, Germany, Finland, and Sweden. Construction of the Russian portion of the pipeline has started, but developers have not been able to obtain permits in Poland and Denmark and have been considering alternative routes. This pipeline's expected in-service date is the end of 2019.